i can't remember why they scanned me at 7 weeks? think it may have been cos i has 2 prev m/c? Most PCTs will not scan before 11 weeks unless there is a reason to bring it forward as in suspected ectopic pregnancy or miscarriage. I know it is difficult waiting, but if you have no reason to be worried you need to either hold on in there or pay for a private scan Congratualtions on your pregnancy, wishing you a happy, healthy 9 or so months! i had scans at 5 and 7 weeks but guess because of previous losses, think if its a natural BFP they tend to assume you are fine! I had thought i may have to go private and i don't mind paying for one because it'll give me peace of mind. i think i am more worried with my df not being here and we can only speak for 20 minutes a week! (how crap is that!) i just need to know if things are going as they should and if there are one or two babies. does anyone know where in staffordshire i could book a private scan? not sure if location is any good. Thats brill, thank you. i am going to phone them to see if they will scan me at 7 wks then i will hopefully be able to stop worrying! The Nhs normally provide a dating scan (8 to 14 weeks) and an anomaly scan (approx 20 weeks). Many early preg units will do 7 week scans for reassurance for women with previous pregnancy loss, they will see you if you have pain or bleeding. Otherwise like others have said you can pay for a private scan. The possibility of twins is not reason enough for NHS to scan early as it makes no difference to your care at this stage. Im smiling reading this as i thought i was mad but i realise im not alone, i have acess to a scanner at work and so far (nearly 12 weeks now) ive scanned myself too many times, every time praying the heart will still be beating, i have decided to give up and leave alone, its not worth the stress, it wont change anything. Ive been looking forward to 12 weeks and now im nearly there i want to be 24 weeks, think my life time of worry has well and truely started. according to my clinic the stats are the same as they are for anyone. About 1 in 5 or 20% of pregnancies end in miscarriage, usually before 12 weeks. Stats vary according to the source but that's the general consensus. After 8 weeks the risk drops to about 10% and after 12 weeks to 2 %. Missed miscarriage simply means that the baby stopped developing but there was no bleed or symptoms to make anyone realise. The problem with a lot of fertility treatment is that the progesterone pessaries maintain the lining of the uterus so miscarriage is more likely to be missed as you're less likely to bleed. Some studies show higher levels of miscarriage for IVF patients but it is thought that this is just because pregnancies are detected earlier in IVF patients as we all are desperate to test!! My main source of worry is the missing of a possible miscarriage as I feel that if I were pregnant naturally I would feel reassured every time I went to the loo and hadn't bled. Although I'm obviously v pleased I haven't had any bleeding it doesn't comfort me in the same way as it would with a natural pregnancy as I know it may just be the progesterone. My clinic are v supportive and just keep reminding me that it's out of my hands now and just have to have lots of PMA. Can't wait for that scan tho and I think we all feel the same. last tuesday my midwife came to visit me at home that was my fist appointment....she explain everything i need to know and she also told me when my next scan is which is the dating scan... she put 9-12 weeks on the green book. i just received a letter today from our local hospital saying to attend the antenatal clinic on 02 january 2009.... i think that would be my anomaly scan by then.....i don't know if they completely missed out my dating scan appointment....anybody had the same experience as me?...should i phone my midwife? or should i just wait, do you think i will receive another letter for my dating scan appointment? When you pray and ask for something, believe that you have received it, and you will be given whatever you ask for. i would phone them up because my midwife told me the first scan is between 7 and 12 weeks. i am having mine at 9wks and a day because i wanted an earlier one cos i am impatient! it sounds to me that they may have misread something because you will be nearly 17 wks then so i would ring and ask for an earlier one as you think there may have been a misunderstanding. i went for my first scan today and saw the baby on the screen, couldn't see much but there was definately one there and it had a good heartbeat! i am so relieved as i had convinced myself it was all some big mistake and had been waiting for someone to come along and burst my bubble! Congratulations - that is wonderful! So glad you got to see your baby and it's HB. I know how you feel, even though i've had the scan and am now 10 weeks i still think someones going to say it's all a mistake !!!! Had my 8 week scan today! Well i had my 8 week scan this morning and was sooo relieved that all is going really well and to plan ... i am actually 8.5 weeks pregnant and been given a due date of 01.07.09!! It currently measures at 2 cm (2 weeks ago it was only 3mm!!) we saw the heartbeating away and the nurse was shocked to see it moving and what she thought looked like was it waving .. i was totally shcoked as didn't believe it could do all this so early on! I have been given a letter to give to GP for a midwife appointment!! I have got a couple of scan pics but unsure how to upload them i think they may scan too big?? Knighty, I am so pleased for you sweetie, it is such a special time clap. Try to relax and enjoy it, will see you in the pg diaries soon. Glad everything is all A-ok Knighty! It really is amazing that they can already move around in there isn't it. To get your pics on here, scan them into your computer and then upload them to Photobucket ( www.photobucket.com ) you can then opt for a 'medium' sized pic and it will give you a link to copy and paste on a post in here and voila! your lovely pic will appear! Even I can use photobucket and I am a total techno dufus! If you need any help with the pics give me a shout and i will try to help! Had 8 week scan today ... with pics! ok ... i've tried to upload the pics ... biggest obviously today ay 8.6 weeks then going smaller to 6 weeks and smallest is the day of ET ...did it work?? ah ha i'm guessing the first one didn;t work so .. how about this ???!! RE: Had my 8 week scan today! Well done you my due date is the 05.07.09 did nt realise we were that close together you scan pic is ace so much closer than mine was last week you can make out what everything is !!! Thats great Knighty! Really pleased that its all going so well this time - relax and enjoy the rest of your pregnancy! Its such a wonderful feeling isnt it? I am now feeling bubba moving around and it doesnt seem that long ago that I had my first scan. Thanks ladies we are so happy! Got another scan in 2 weeks so more piccies to come!! Congratulations, what lovely scan pics, i'm alittle ahead of you (due 14 June 09) and have my next scan on thursday and can't wait. Awww, the pics are lovely Knighty. Look forward to seeing more in two weeks time! Thanks Michelle ... i'll try that next time! I'm turning into a real "techie" sort of person ..lol!! I have my first scan on Fri which I am totally shocked about as I wasn't expecting one until Jan. I didn't know that you got an 8 week scan, I thought it was a 12 week scan. I am sooo excited though as I feel like i'm in a dream just now. Good luck for your scan on Friday. May I ask what hospital you are with - we were treated at GRI. GOod luck with your scan i had my 8 week scan last week and it was amazing! Hope your scan on Friday is fab! It's lovely not having to wait so long cos you've had fertility treatment isn't it! It'll be lovely to see your little one so soon. Have fun! Thanks girls, i'm so excited . 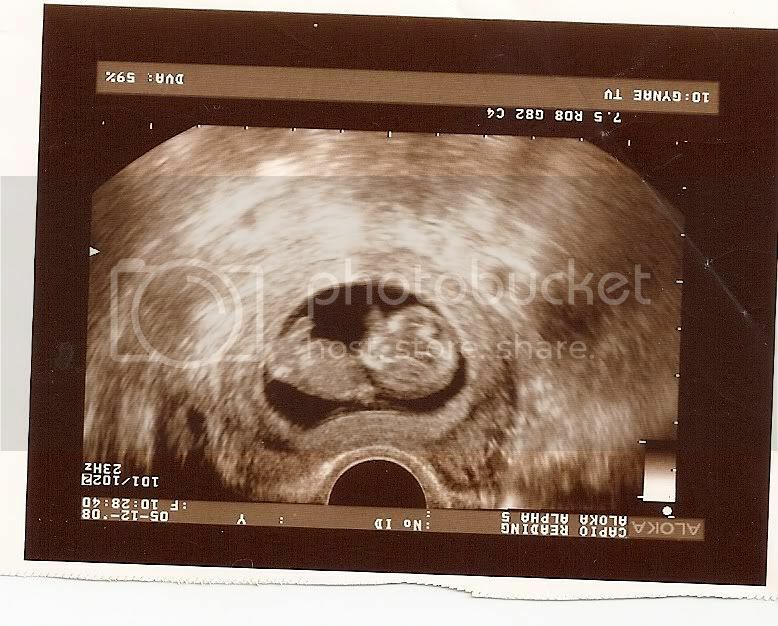 11 week scan & pic ! !